How did Songhurst Guitars find VisiPak? Was Songhurst looking for something very specific or wanting suggestions? We were definitely looking for a tube, specifically a USA made tube. What is the product inside the tube? We manufacture guitar slides. ALL of our 25 SKU's are packaged in VisiPak tubes. When did the product first hit the market? Product originally hit the market in 1999. My company, Songhurst Guitars, LLC purchased The Rock Slide® in 2011. It WAS made in Taiwan, at that time. Our goal was to re-launch it as a fully USA made product. ALL manufacturing is now done in the USA including down to our stickers. Is this product (all 25 items) in retail stores for purchase? 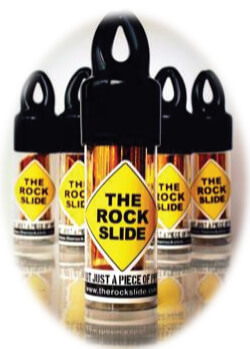 The Rock Slide® is in over 400 USA stores from small indie shops to the Guitar Center Chain/web. (http://www.guitarcenter.com/The-Rock-Slide-Brass-Rock-Slide-Guitar-Slides-110721255-i3917400.gc) We also have distributors in Hong Kong, South Korea, Singapore, Japan, Mexico, Great Britain, North Holland, Australia and Canada. Where / how is the product used? Is VisiPak providing any Contract Packaging Services for the Rock Slides? Was there a problem solved with our packaging? Rob solved many problems for us. When we took over they were packaged in these TERRIBLE little bags with a fold over cardboard label stapled to the top. YOUR packaging has actually increased sales for us because people can check out the slide, and the best part is the store can put the cap right back on and it looks good as new. Before, store owners didn't like to let the customer try them out because it was required to destroy the packaging in order to take the product out. By changing to VisiPak packaging, was money saved (vs prior packaging)?